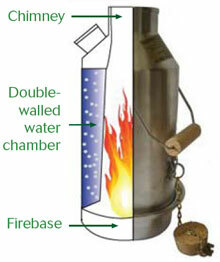 KELLY KETTLE - Camp Kettle boils water in outdoors fast in extreme weather conditions. 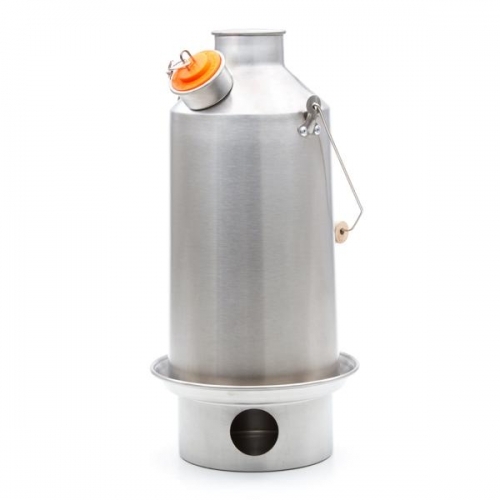 Kelly Kettle® Base Camp Stainless Steel Kettle holds 50.7 fl. oz. (1.5 liters or 6.3 cups) of water. 15 inches tall (packed: 13 inches), weighs only 2.6 pounds. This is the kettle & firebase ONLY. Cookset and pot support sold separately. Or buy as a Complete Kit (kettle, cookset & pot support included). Kelly Kettle® Essential Camping Equipment for the Outdoors. Great for: "Base Camps, Outfitters, Fishing, Hunting, Camping, Trekkers/Hiking, Family Picnics, Scouts, Emergency/ Disaster Preparedness Kits & etc." Order yours now!